Vern Ligon was born on the 4th of July 1921 in Frankfort, Kentucky. He enlisted in the Aviation Cadet program of the U.S. Army Air Forces on March 31, 1942, and was awarded his pilot wings and commission on May 20, 1943. After pilot training, Lt Ligon was assigned to the 377th and then the 379th Fighter Squadron of the 362nd Fighter Group, flying P-47 Thunderbolts in the European Theater during World War II. He was shot down during his 35th combat mission on April 23, 1944, and taken as a Prisoner of War by the Germans. After spending 372 days in captivity, he was repatriated on April 29, 1945. Ligon next became a Deck Officer on crash boats and then trained as a Petroleum Officer. He served in these ground assignments from 1945 until May 1956, when he went back on flying status as a B-47 Stratojet pilot with the Strategic Air Command. Ligon next served as a Range Officer at Patrick AFB, Florida, from July 1964 to February 1967. He transitioned into the RF-4C Phantom II later in 1967, and began flying combat missions in Southeast Asia in September 1967 with the 11th Tactical Reconnaissance Squadron at Udorn Royal Thai AFB, Thailand. On November 19, 1967, Ligon was shot down over North Vietnam while flying his 26th combat mission and was taken as a Prisoner of War, becoming one of only two POWs in Vietnam to have been a POW twice. After spending 1,943 days in captivity, Colonel Ligon was released during Operation Homecoming on March 14, 1973. His final assignment was as Director of Range Operations, Air Force Eastern Test Range, at Patrick AFB, Florida, from September 1, 1973, until he retired from the Air Force on August 31, 1974. Vern Ligon died on February 28, 1995. 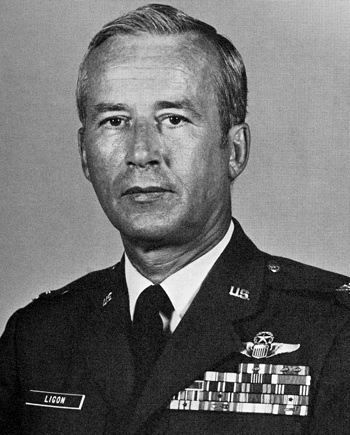 Lieutenant Colonel Vernon P. Ligon distinguished himself by gallantry in connection with military operations against an opposing armed force as an RF-4C Aircraft Commander over North Vietnam on 24 October 1967. On that date, Colonel Ligon displayed outstanding aerial competence and courageous professionalism in the aggressive pursuance and acquisition of the assigned targets. The tenacity of this officer to attain the objective against formidable defenses is in accord with the highest military standards. By his gallantry and devotion to duty, Colonel Ligon has reflected great credit upon himself and the United States Air Force.